Did Federer address the issue in press after his match? He knows this place. As does Nadal. The ATP has finally found a leader in Novak Djokovic who has the mental fortitude to raise the banner of rebellion and to lead that revolution. Nadal and Federer will be more than happy to see Djokovic distract himself from his tennis career again. It's truly their only chance. Can you guys discuss the viability of that suggestion, and inform me of the result, lol. Greatness that defies all logic. Donaldson came out all guns blazing ready to take it to the matador but nothing he did was enough. Rafa was so in the zone. Donaldson has a great game though. One of the bright up and coming players. Starting to get messy, with Rafa and Fedr both starting to push back. Weird that they fell out themselves over ATP politics. Coming together in their old age. Djokovic preparing a counter-strike. He is in a company of some guy and I don't have a clue what he is saying here but he is probably up to some no good. That they are phenomenal tennis players doesn't mean that they are phenomenal elsewhere. Roger and Rafa are like blood brothers. They do fall out every now and again but they are still brothers. 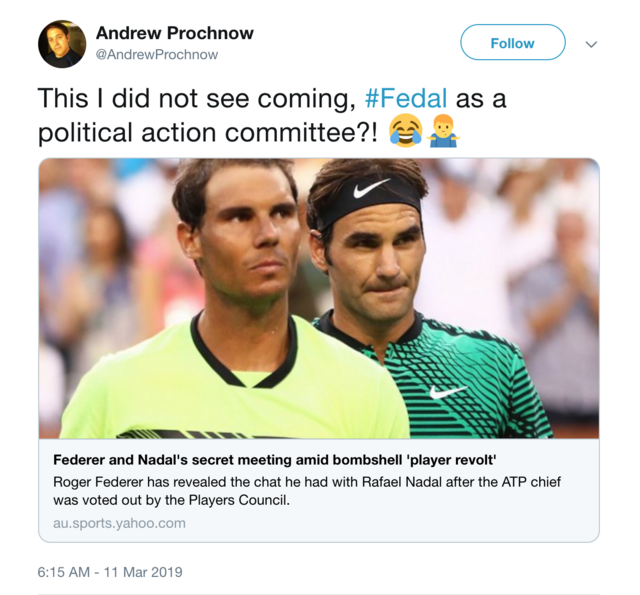 Lol if Fedal think they can go outside the council and do things their way. They have common business interests. That makes them "business partners", not "blood brothers". That is like asking why Bill Gates's corporation gets to keep the lion's share of the income from selling Windows OS, instead of sharing it with his workers in the China factories that "produce" it. Maybe Federer, Nadal and Djokovic feel like workers in a factory in China? Not a good analogy. No one cares if Lei-Chen or Fu writes a part of the code for Windows. The software is the product. People do care if a professional tennis player, or you or I are playing in a tournament for which tickets have been purchased. The athletes are the product. Bill Gates can hire other software people. Roger Feder cannot draw the people Roger Federer can. There is a lot of genuine mutual respect/admiration especially as they’ve aged. Is there a way to remove the council by a motion of no confidence or something like that? Either way, I'm just here for the drama. Glorious, messy, drama. How long does the president of the council serve for? It's a two year term. Djokovic was reelected a few months ago.